Go back to a simpler time with this Game Boy-inspired physics puzzler. Giving an already established video game a retro demake is always an interesting proposition. Gentlemen...Ricochet Mini! takes the original physics puzzler and outfits it with graphics and gameplay that you'd find on the original Game Boy to surprisingly pleasing results. 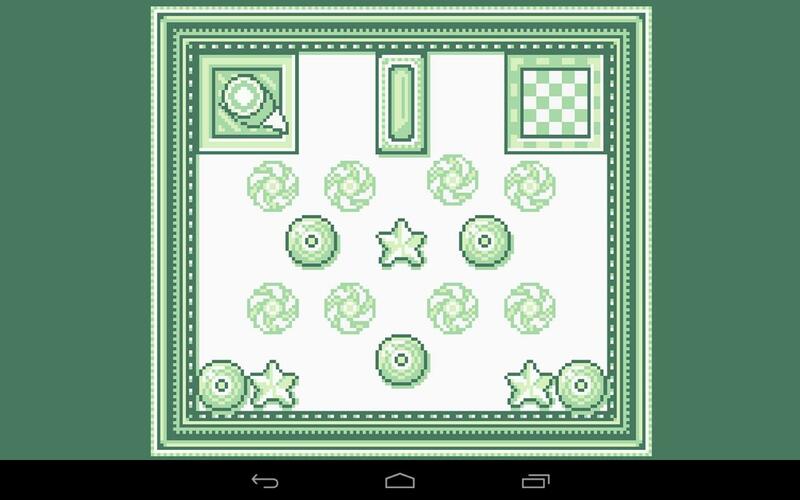 If you found the physics puzzler difficult before, you'll find that this version of the game has been streamlined considerably as something that could actually work on the original Game Boy. You only need to use one tap to control things, so what you'll do is tap for your little ball to go in one direction, and it'll go there at maximum strength. You can tap anywhere to hold onto a magnet pad, and launch yourself from there. From there you only need worry about avoiding obstacles and the hazards that come from accidentally bumping into them. There are several different puzzles to soldier through, and plenty of things to do to keep you busy. This is a "dumbed down" version of the original game essentially, and thus features classically-styled graphics and retro 8-bit music to accompany it, so if that's not something you enjoy you might find yourself turned off by this endeavor. Additionally, some of the levels do tend to become needlessly frustrating and you have little control in some areas due to the fact that you've only got one tap to work with. Gentlemen...Ricochet! Mini is an interesting experiment that tones down an entire game for Game Boy-styled graphics and for the most part succeeds.